Yesterday, we showed you the very brief Jonah Hex trailer trailer, which was basically an advertisement for the SyFy premiere of the trailer this Thursday. Today Warner Bros. has debuted the brand-spankin'-new poster, featuring Josh Brolin and Megan Fox, with the appropriately ironic tagline "Revenge Gets Ugly." Jonah Hex stars Josh Brolin, John Malkovich, Megan Fox, Will Arnett and Michael Shannon and is slated to hit theaters June 18. 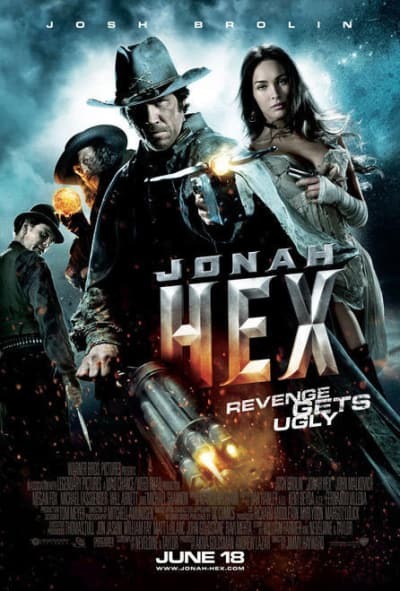 Jonah Hex (Brolin) is a scarred drifter and bounty hunter of last resort, a tough and stoic gunslinger who can track down anyone... and anything. Having survived death, Jonah's violent history is steeped in myth and legend, and has left him with one foot in the natural world and one on the "other side." His only human connection is with Leila (Megan Fox), whose life in a brothel has left her with scars of her own. But Jonah's past is about to catch up with him when the U.S. military makes him an offer he can't refuse: in exchange for his freedom from the warrants on his head, he must track down and stop the dangerous terrorist Quentin Turnbull (Malkovich). But Turnbull, who is gathering an army and preparing to unleash Hell, is also Jonah's oldest enemy and will stop at nothing until Jonah is dead.